They said they’d turn up, and turn up they did; one of them was even clutching a couple of bags of silver beet for the animals. 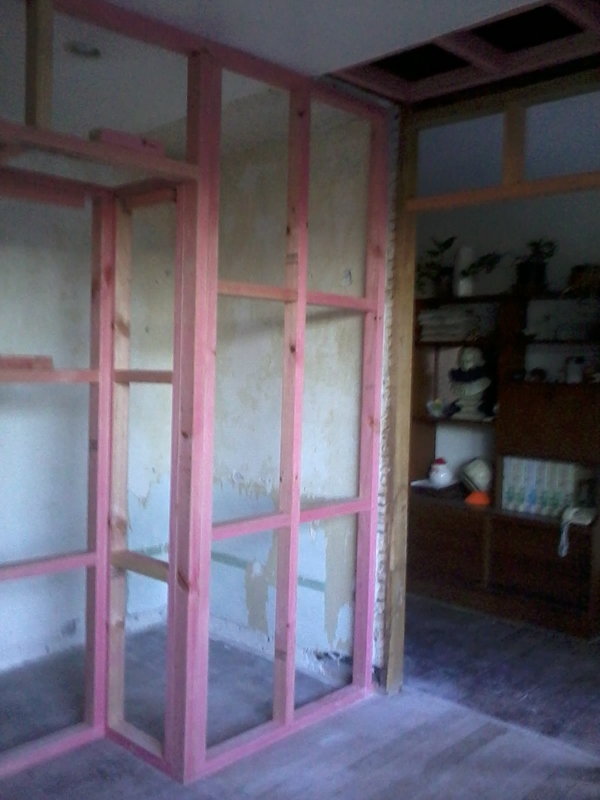 Today the Homestead once again resonated to the sound of dropsaw and hammer as the dynamic duo of Pop and U.T took another swipe at The Farmer’s bedroom makeover. While the on-site Homesteaders took advantage of another gorgeous day to knock yet more weeding on the head, our progress round the garden was punctuated by hails from the construction zone. It turned out that today was to be a day for decisions: where to hang the door, what size for the wardrobe, will this layout work for the store cupboard… As we stood, barefooted and grubby kneed, trying to envisage just how much The Farmer would ever need to hang up in a wardrobe (this, for a bloke for whom dressing up means his good jeans and a clean T shirt) or whether his shoes would fit into the space allocated, The Milk Maid made a very interesting observation. As a family, we are infinitely better at adapting our surroundings to make things work for us than we are purpose-building for our requirements. Somehow, deciding the correct position to erect the wall dividing the wardrobe from store cupboard became an issue of such magnitude it almost overwhelmed us. Of course, it didn’t. We got there in the end with the help of a couple of planks of wood to symbolise the walls, a coat hanger (width template) and a pair of The Farmer’s shoes (depth), but for a moment it was scary. Putting it simply, what if we got it wrong? What if, after shuffling the planks around in millimetre increments, The Farmer suddenly decides to shell out on a Liberace-style rhinestone encrusted suit and matching cape and it doesn’t fit in the wardrobe, or his feet start growing again, or he develops a penchant for winkle pickers, or the store cupboard dimensions make for heaps of wasted space or…or…or… Then we took a deep breath, gave ourselves a mental slap and calmed, as they say, the farm. It’s all done and dusted now. The wall framing is in place, a fait accompli, and we’re once again happy in the knowledge that there’s no way it will be absolutely 100% perfect because life, ours anyway, just isn’t. So when The Farmer turns up with his new suit, cape and winkle picker ensemble, we’ll do what we always do: we’ll adapt and find a way to make it work. And then we’ll take a photo to share with you all. This entry was posted in community and tagged builder, builders, building, choices, Christchurch, decisions, making do, New Brighton, New Zealand, Otautahi, renovating, renovations. Bookmark the permalink. I look forward to the photograph. I love looking at your blog since part of my heart is still in New Zealand. The Farmer is going to be one happy fellow when this is all finished!! And hey, a cape and rhinestone encrusted outfits…you do not hang those in a cupboard…you hang those on display! Happy weeding on your side of the world! I somehow think that it is Farm Girl who will acquire the rhinestone studded outfit and cape, lol, and then you will find them switching bedrooms, and suddenly that spacious closet will be tiny. 🙂 And frankly, no store cupboard is ever too large…you know the rule…nature abhors a vacuum…so I’m sure that you will find a way to make use of the potential gaps on the shelves. I shudder to think that my basement was once empty, and now…well, you’ll never being seeing a picture, that’s for sure. It is the problem with creating things isn’t it. What if it isn’t just right? What if we do it wrong? If only the duo had just made these decisions on their own, and everyone could happily have grumbled (if sotto voce) if it didn’t suit, which just goes to show how wise they are. You are so right! Rhinestones, capes and bling in general is very much our Farm Girl and very much not The Farmer. The Duo also know their onions – or nails/planks/whatever – and are very careful not to lead the decision making in any way. Planning hurts the head which is why I choose things rather arbitrarily and live with the mistakes or the good things with equal calmness. I generously let Mrs Tootlepedal do the worrying for me.